Service station operations created a benzene contaminant plume in tight subsurface soils. A dual-phase extraction system (DPE) was installed and removed a total of 9,965 pounds of petroleum hydrocarbons over two 90-day operational periods. However, contaminant removal reached asymptotic levels and a more effective remedial strategy was needed to address the remaining benzene concentrations. The DPE system was shut down in December 2004 and RegenOx® was selected to evaluate the effectiveness of reducing benzene and MTBE concentrations in tight soil lithology. RegenOx was pilot tested around well DPRW-6 to evaluate its effectiveness in tight soil. A total of 1,439 pounds of RegenOx was applied near well DPRW-6 as a pilot test in August 2005 (510 lbs) and July 2006 (929 lbs). Benzene concentrations declined within 15 weeks by 76% and successfully reached the Site Specific Target Level (SSTL) (Graph 1), prompting a design for full scale implementation. The objective of full-scale treatment was to provide rapid mass reduction of benzene concentrations and reach the SSTL of 20.1ppm across the 9,100 ft2 source area. 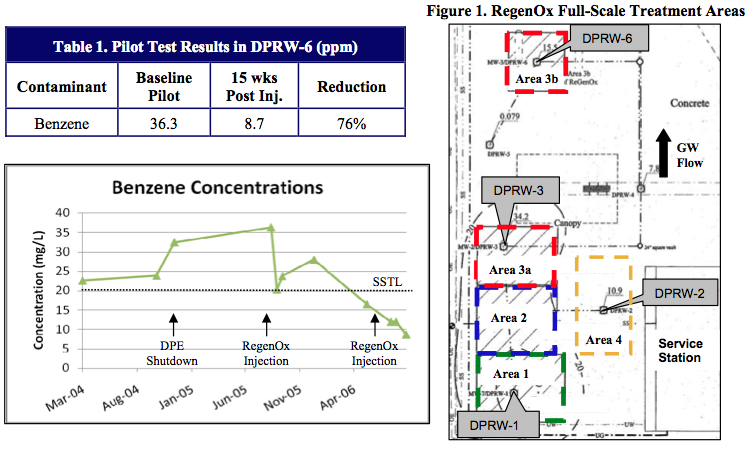 Benzene rebound at DPRW-6 (the original pilot test well) six months post-injection suggested that a previously unidentified plume had re- contaminated that area. 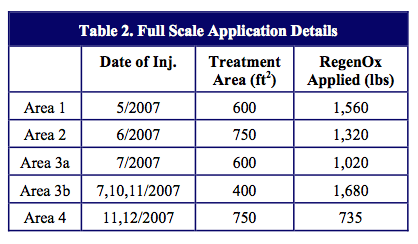 After additional site characterization was completed, 7,110 pounds of RegenOx were applied during six injection events over five treatment areas (Figure 1). The RegenOx injections were performed over a 6 month period due to weather delays. Monitoring was conducted to observe potential contaminant rebound from areas requiring additional injections. The applications targeted a treatment thickness of 14-20 feet bgs into silty clay with intermittent sand “stringers”. RegenOx was injected using a top-down direct-push injection technique with 5-15 lbs of RegenOx injected per vertical foot. Prior to the full-scale application, benzene concentrations exceeded the SSTL of 20.1ppm in all wells. Monitoring over a 7 month period prior to remedial treatment indicated an increase in concentrations from 12 – 32ppm to 20.4 – 44.1ppm. after the final application event in December 2007 indicated a benzene reduction to at or below the SSTL in all wells (Graphs 2) including the original pilot test well DPRW-6. 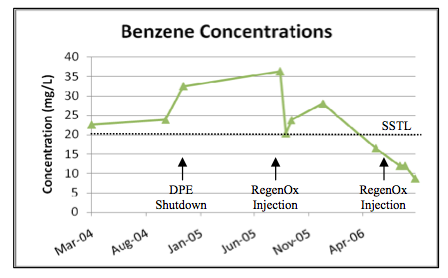 As monitoring continued, a decline in benzene concentrations persisted via natural attenuation and all wells sampled below 10ppm in August 2009. Based on the reducing trend observed over the past 12 months, the site was recommended for closure.